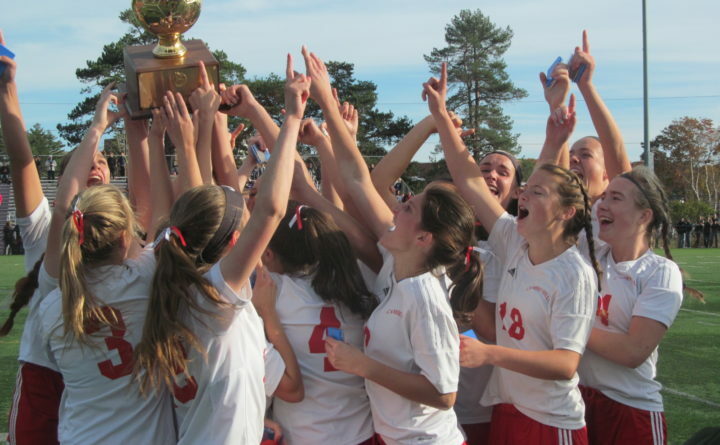 Members of the Camden Hills girls soccer team celebrate with the gold ball after beating Scarborough 3-2 in the Class A state final at the Deering High School field in Portland on Saturday. PORTLAND — Camden Hills junior attacking midfielder Kassie Krul and sophomore striker Kristina Kelly were two of the primary reasons the Windjammers won their second straight Class A North title and they teamed up to also make it two consecutive state titles on Saturday afternoon. Krul scored two and Kelly collected her 39th of the season as the Windjammers built a three-goal lead and survived a late Scarborough rally to post a 3-2 triumph at the Deering High School Field. Camden Hills (17-0-1) attempted 19 shots to Scarborough’s 14 and put 10 on net compared to Scarborough’s four. The Red Storm, which received second-half goals from Gaby Panagakos and Ashley Sabatino, wound up 16-1-1. Camden Hills had the majority of possession but the Red Storm launched several long balls and had plenty of speed up front with the likes of Panagakos and Molly Murnane. They challenged the back four of Camryn Langille, Grace Blackwell, Ella Pierce and Sarah Spizzuoco. Krul opened the scoring in the physical affair with 26:13 left in the first half. Kelly made a run down the right flank and passed it over to Eliza Roy, who quickly slid it to Krul at the top of the penalty area. She beat standout Red Storm goalkeeper Emily Royce with a well-placed, left-footed shot. Camden Hills carried the play over the first part of the game but Krul’s goal actually ignited the Red Storm and they started generating some chances. Shortly after Royce made a terrific save off Kelly, Camden Hills outside back Spizzuoco raced back to deny a glittering break-in opportunity as she got her foot on Panagakos’ shot at the last second. “I knew I needed to save it. I went as fast as I could and got my foot in there to block it,” said Spizzuoco. Spizzuoco was entrusted with the job of marking Panagakos, Scarborough’s top scorer, and she turned in an exceptional performance. “I just tried to keep her to the outside and stay right on her so she couldn’t turn,” said Spizzuoco. Kelly and Krul supplied the Windjammers with what proved to be a necessary cushion early in the second half. Kelly’s school-record 71st career goal came off one of her dynamic spurts down the right wing. She was able to get some separation and drilled a low shot under Royce into the far corner 5:44 into the half. Krul scored the game-winner 5:16 later with a curling, 28-yard free kick that sailed just over Royce’s hand and under the crossbar. But the resilient Red Storm never quit and clawed their way back into the game. Panagakos scored with 18:59 left after Camden Hills goalkeeper Izzy Lang (2 saves) dove out to cover a ball off the foot of Leah Dickman only to have the ball spill out of her hands and Panagakos swept it home. Royce (7 saves) kept the Red Storm within striking distance by making a diving stop off Kelly and Sabatino made things interesting with 7:02 left when she alertly raced onto a ball that pinballed into the penalty area and headed it home from 12 yards out. But the Windjammers hung on.